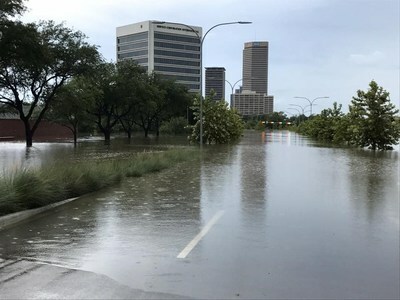 DALLAS, Sept. 8, 2017 /PRNewswire/ -- Most of the water has receded in Southeast Texas, but for survivors of Hurricane Harvey, the real work is just beginning. Some affected residents have started the demolition and cleanup of their homes, while others remain at shelters with no return date in sight. For those who have lost everything, health care is a particularly pressing need. This region will continue to require the support and compassion of all Americans for months, even years to come. Le-Vel is proud to present Americares with a donation of more than $430,000 to address the urgent medical needs of Hurricane Harvey survivors. Americares is a global organization dedicated to providing humanitarian assistance and quality health care within some of the world’s most vulnerable communities. 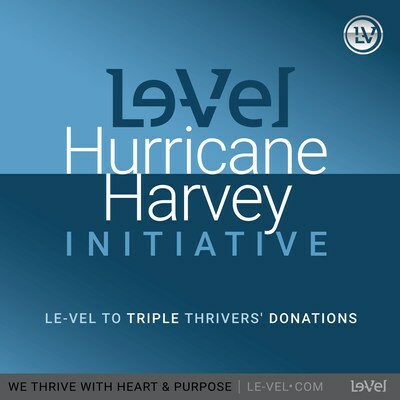 With that spirit in mind, Le-Vel Brands, the world leader in human nutritional innovation, established a Hurricane Harvey relief fund. For this relief initiative, Le-Vel chose to partner with Americares, a global organization dedicated to providing humanitarian assistance and quality health care within some of the world's most vulnerable communities. Le-Vel challenged its employees, independent Brand Promoters, their customers and the general public to contribute to the cause. In turn, from Aug. 30 – Sep. 7, the company tripled the donated amount of every donation made to this fund, generating over $430,000 in donations from Le-Vel to Americares. Americares is currently on the ground in Southeast Texas, distributing water, providing aid and mobilizing medical outreach with local partners. The organization has delivered more than $1.5 million in medicine and supplies to local organizations helping survivors in Texas. 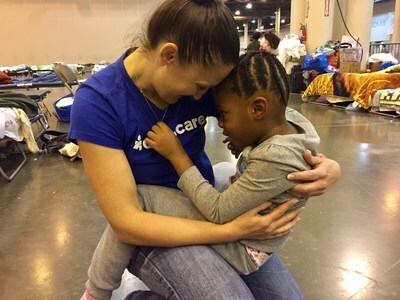 These include evacuation shelters in Houston, as well as free and charitable clinics that serve low-income and often uninsured patients, whom Americares supports through its U.S. Program. While continuing to meet emergency health needs, Americares coordinates planning with partners for the long-term recovery of health services. Since its founding in 1979, Americares has delivered more than $15 billion in aid to 164 countries, including the United States. Over 97 cents of every dollar donated to Americares goes to and is directly spent on improving the health of people in need. Le-Vel Brand Promoter Kellyn Jezierski, who resides in Houston, says that while she feels blessed that her family and home are safe, "everyone knows at least three to five families who have lost everything." Kellyn adds that the outpouring of support from throughout the country has been overwhelming, and Le-Vel's huge support and donation makes her incredibly proud to be a Thriver. "Le-Vel has always been about hope, community, empowerment and the strength of the human spirit," say Co-CEOs and Co-Founders Paul Gravette and Jason Camper. "We were founded on the mission to help as many people throughout the world achieve the kind of life they deserve. Basic health shouldn't be a luxury; it's a fundamental right. Our neighbors in Southeast Texas need access to water, first aid, medication and other necessities. This is an urgent situation that can't wait. We're a family, and when times are tough, this family comes together. Le-Vel is deeply honored to partner with AmeriCares to help survivors of this terrible storm get back on their feet as soon as possible." Founded in 2012 by Jason Camper and Paul Gravette, Le-Vel formulates and sells nutritional/health and wellness products and is the only health and wellness company that uses cloud-based technology for its day-to-day operations. Le-Vel's cloud-based infrastructure enables the company to keep overhead to a minimum while increasing commissions to its independent Brand Promoters and putting more money into the THRIVE product line. Le-Vel products include DFT, Thrive Premium Lifestyle Capsules, THRIVE Premium Lifestyle Mix, THRIVE Kids, Activate, Boost, Balance, Black Label, FORM, Move, Rest and Pure. Le-Vel has more than 7 million Customer and Brand Promoter accounts, currently ships within the United States, Canada, Australia, New Zealand, the United Kingdom, and Mexico and exceeded $450 million in revenue in 2016. Le-Vel received Direct Selling News' Bravo Growth Award in 2016 in recognition for its extraordinary year-over-year growth – the largest in the world in direct sales. For the past two years, the company has also been named to the DSN Global 100 (ranking #44 this year), an exclusive ranking of the top revenue-generating companies in the worldwide direct selling industry. For more information about Le-Vel, visit le-vel.com.